Shadows Over Bogenhafen The Steinhager Offices. Posted by GM. ooc: There are only two entrances. A set of doors in the north and a set of doors in the south. The rest are windows. 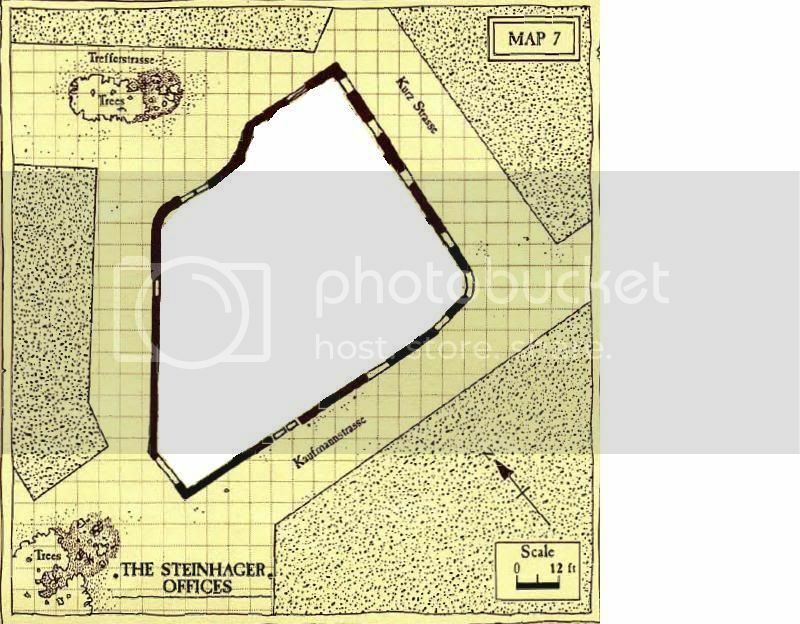 The Steinhager offices are on the north side of Kaufman Strasse, and a little to the west of Handels Weg making it less than a hundred yards from the edge of the Adel ring. The structure itself is an imposing single story building with the family's badge, a barrel with the letter 'S' branded on it, hanging above the front (Kaufmanstrasse) entrance. This message was last edited by the GM at 19:37, Sat 09 Oct 2010. "Ill take the southwest corner near the trees, you should take the northwestern. This way we can see each other in case it gets ugly. Keep in the shadows. I have a plan to talk to this fellow. If i cough, come out." Ulrich instructs before he moves to take a position under the trees and in hiding.